Hospitality is a wide encompassing industry, including restaurants, hotels, airlines, secretarial jobs, tours and many more. This means there are many variables to factor into your resume depending on which sector of hospitality you work in. Below you will find tips and pointers on how best to customize your hospitality resume for the job you are applying for. However, if you are short on time, feel free to try out our easy-to-use resume builder to create your resume in mere minutes. Not the industry you are looking for? 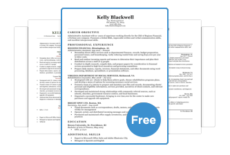 Check out all of our resume samples. Not in love with this design? Find a resume template that suits your taste. If you need additional help, peruse our expansive cover letter collection for helpful pointers on how to get your cover letter to shine as much as your resume. 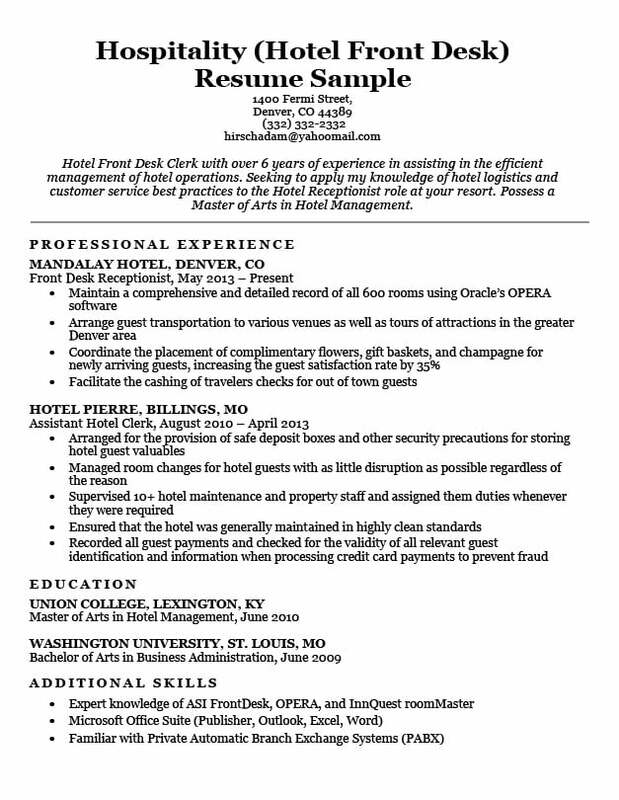 Hotel Front Desk Clerk with over 6 years of experience in assisting in the efficient management of hotel operations. Seeking to apply my knowledge of hotel logistics and customer service best practices to the Hotel Receptionist role at your resort. Possess a Master of Arts in Hotel Management. As someone who works in the hospitality industry, you know how important fast and efficient service is to your customers. On this page, we strive to do the same by providing useful inside tips. We’ll teach you how to write your hospitality resume professionally, in no time. If you want to take your Hospitality resume to the next level, consider checking out our 6-Step Writing Guide. Before starting your resume there are a few very important things to consider. If you keep asking yourself these questions throughout the resume writing process, you will end up with a stronger resume and increase your attractiveness to employers. What do I bring to the company that they want? How can I translate previous hospitality oriented experiences to fit this position? What are the key hospitality aspects of this company and it’s industry? Know yourself, know your target, and you will be prepared for success. You should be able to confidently answer all three of the above questions before you write your resume. Do you bring unique international experience to the table from your experience working at a resort in Thailand for a year? Will your customer service skills from working for an airline be applicable in a tourist park? Does the company pride itself on family friendliness or refined elegance? Know yourself, know your target, and you will be prepared for success. When writing the career objective for a hospitality resume, you want to express the main points that qualify you for the job you’re applying for. So, the first piece of information you should include is how long you’ve been working in the industry. Secondly, you should say what part of the industry you were involved with. For example: customer service, maid services, food and beverage, management, maintenance, etc. Then, you should mention any education, certificates, or any other form of recognition that would catch the eye of a hiring manager. Since this is the first sentence it’s also your first impression to an employer, just as a concierge or welcome desk will be the first impression a guest receives at a hotel. Follow these basic rules, and your professional experience section will look great. Always start with your most recent work experience at the top (reverse-chronological format). Make sure that your first bullet point under this job title is the highest impact, most impressive aspect of your current/previous job experience. Ideally, it will also be related to the job that you are applying for. Below, we’ve included a picture of how a hospitality resume professional experience section should be formatted. Notice how each bullet begins with a verb phrase! “Replace the water,” “Arrange for the laundering,” “Organize the provision,” etc. Show off that hospitality degree! Or, display any other degree that you may have received. If you never received a degree, that’s fine too. You’ll still want to include the name of the university you attended, your major, the date you left your university, and your GPA (if above 3.4). Don’t neglect your education section because often times if the position is above entry level this will be the first think many HR Managers look at. Training schools or on-job certifications should be included as they will be valued by other employers even if they aren’t coming from a traditional university. Language Skills (working in hospitality is an industry saturated with international travelers, being multi-lingual is a huge plus, but just saying “Hello”, “Thank You”, “Welcome”, and “Goodbye are still great skills. Communication skills. If you are a great communicator then say so, as before you get an interview and employer might not be aware of these “real-time” skills. Software Skills. If you have experience with particular industry software include them as well, since you know them you will be saving your company time and money! Below, we’ve included a picture of a hospitality resume’s additional skills section. Try to make your skills related to the job you’re applying for. Want a resume like the sample above? Our online resume builder makes it easy!